On Jan. 17, the Ontario government announced multiple financial changes for university students, including the cutting of the Ontario Student Assistance Program (OSAP). For many students, this means that they might not be pursue or complete a degree, as financial changes will be applied this September. The cost of cutting OSAP is hardly remote to our campus: University documents indicate that six per cent of McGill students receive funding from the program. Beginning in 2017, Ontario students whose families earned less than $50,000 per year had their tuition fully subsidized by OSAP in the form of non-repayable grants. As family income increased above this threshold, so did the ratio of loans to grants. This program was particularly successful in assisting indigenous students, whose enrolment numbers jumped by 36 per cent after the introduction of OSAP. Premier Doug Ford’s government plans to scrap this program entirely, instead offering a 10 per cent tuition cut for all students. This is not an equal trade-off: The cut will save those pursuing a Bachelor of Arts about $660 per year, while preventing other students from attending university altogether. Enacting a decrease at the cost of impeding many from pursuing their education is unjust. Besides OSAP, the Ford government announced that all ancillary fees, such as student association dues and club fees, must be made optional, which may leave some McGill students envious. While the Students’ Society of McGill University (SSMU) has had a relatively scandal-free year, chronically low voter turnout and social media complaints show that cynicism about student government remains. In truth, Ontario students’ new reality is hardly desirable. The change to student fees undercuts students’ ability to advocate for their interests, and it, along with a 10 per cent tuition cut, is simply a distraction from the Ford government’s gutting of OSAP. Depending on a student’s program, they can expect to pay $500–$2,000 per year in ancillary fees to fund services such as athletics facilities, student support centres, and student groups. The government’s pledge to make ‘non-essential’ fees optional comes with a catch: It excludes fees that support general ‘health and wellness,’ mental health, and student safety, which are often the most expensive. 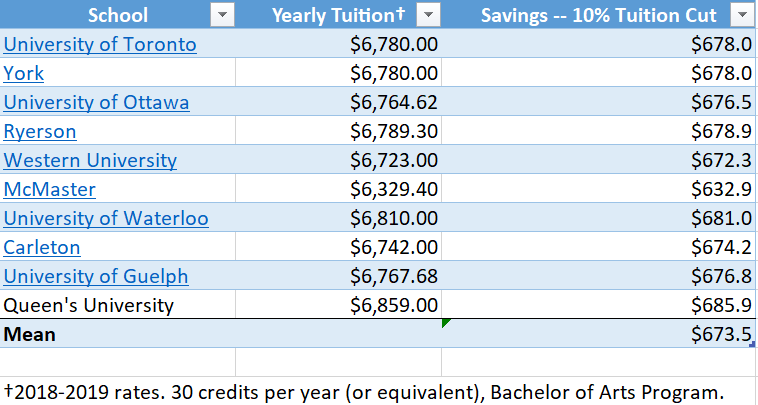 Students at York University, for example, may only save about $120 per year. Presenting these fee cuts as a way for students to save money is far from the truth, and only serves as a diversion, enabling some students to overlook the OSAP cuts in the pursuit of frugality. Included in the fees which the Ford government plans to make optional are those that fund student unions and campus media, including television, radio stations, and newspapers. Jeopardizing these organizations’ futures could be a serious blow to students’ ability to lobby institutions for necessary change. Many student unions actively lobby provincial and federal governments for favourable policy changes; former SSMU Vice President (VP) External Connor Spencer was instrumental in the creation of Quebec’s Bill 151, which requires all post-secondary institutions in the province to maintain a sexual violence policy. Student media hold university administrations and student unions to account. The fees that fund these groups are approved by popular referenda and are not passed arbitrarily. Dismissing these groups as ‘non-essential’ demonstrates how out of touch the Ontario government is with students’ realities. There are no signs that similar cuts will come to Quebec: During the election, the Coalition Avenir Québec promised a modest funding increase for post-secondary education. However, Quebec’s history of conflict and protest between students and the provincial government gives these changes particular resonance. Moreover, the six per cent of McGill students who receive OSAP funding will have their futures upended by the Ford government’s announcement. Regardless of origin, students should speak out against Ford’s proposed changes and amplify Ontarian students’ concerns for their futures. The support student associations provide are often essential to students’ wellbeing of individual students, and the advocacy of student unions and media can directly affect students’ lives. Moreover, many students will now not be able to attend university at all, and the Ford government is jeopardizing those students’ futures in favour of a minor tuition cut. This is not something McGill students should hope to see replicated on their campus, and it is crucial that they support Ontarian students, while also engaging with their own unions and associations.